Apple invited a handful of journalists to Cupertino to talk about the future of the Mac platform. The Mac Pro is receiving a minor update this week, but the most significant updates are coming later this year, or even later. You have already read the news. But we thought we would also use this opportunity to share a transcript of the interview with Phil Schiller, Senior Vice President of Worldwide Marketing; Craig Federighi, Senior Vice President of Software Engineering; John Ternus, Vice President of Hardware Engineering. Bill Evans from Apple PR was also in attendance. It was lightly edited for length and clarity and does not include some small asides and comments made off the record. Phil Schiller: We’re here to talk about the Mac. The Mac is doing really well. We’re really proud of how things are going. We’ve been, in general over the last decade, growing faster than the PC industry. Last year we had a little bit of a setback, and then this year, back to growth again, [and] growing faster than the industry. It’s something we plan to keep on doing for a very long time. Some numbers that are pretty powerful — or meaningful to us, anyway: the Mac user base is approaching 100 million users. A lot of customers! It’s nearing a $25 billion of annual run rate. And based on that, it is close to being a Fortune 100 company all by itself. As a business, the number of users is super important to us. It always has been, always will be. This is an unusual thing to get together like this [laughter]. This is in-between a product announcement, there’s no black cloth that’s going to come off of something right now. That’s not why we’re here. While those moments are really fun, we thought it deserved a moment to talk about the Mac, and particularly, the Mac for our pro users. We’ll talk about what’s going on and frankly, be a little more transparent with some of the things we’re doing, some of the places we’re going, because our pro users desire that and we care deeply about them and we’re dedicated to communicating well with them and helping them understand what we’re doing and what we’re up to. We want to be as transparent as we can, for our pro users, and help them as they make their buying decisions. They invest so much in the Mac, we want to support them, and we care deeply about them. So that’s why we’re here. We’ve certainly been getting feedback from a specific group of users in particular, desktop Mac Pro users. We’ve been listening to that. We’ve been talking to them! We’ve actually been going out, meeting with a lot of pro customers to understand how they use our products, what their workflow is like, things they might need. So we certainly understand a lot about them; there’s always more to learn but we understand a lot about them. We’ve been thinking deeply about what we should be doing and how we should be doing that, and that’s a little bit of what we want to communicate today. One of the interesting things through all this has been the feedback on MacOS. It’s been so positive. It is in general, across our Mac user base — but specifically amongst our pro customers, the feedback on MacOS has been off the charts. They love the Mac, they love MacOS, they love it as a pro workflow, they love it as a pro app environment. There certainly always is feedback on what we could do better. But in general, the love for MacOS is incredibly strong. And that’s a great thing to hear. We want to reiterate that quite a while ago, a great matrix was drawn on the wall, with four quadrants in it [this product matrix]. A very brilliant, clear view of what we should do. We want to make sure everyone understands that not only do we continue to believe in the Mac, but we believe in that product quadrant strategy. We believe in filling every one of those boxes with great products, the best products available, for every one of those segments — so to the extent that anyone doubts whether we believe in that view anymore, they shouldn’t. We continue to believe in that, and we want to excel in every one of those quadrants. Phil Schiller: Yeah, yeah. First of all, when we talk about pro customers, it’s important to be clear that there isn’t one prototypical pro customer. Pro is such a broad term, and it covers many many categories of customers. And we care about all of these categories, and there’s a variety of different products those customers want. There’s music creators, there’s video editors, there’s graphic designers — a really great segment with the Mac. There’s scientists, engineers, architects, software programmers — increasingly growing, particularly our App development in the app store. So there are many, many things and people called pros, pro workflows, so we should be careful not to over simplify and say ‘pros want this’ or ‘don’t want that’; it’s much more complex than that. As we look over our business on the Mac, a couple things that are really fascinating: we’ve certainly said for a long time that Apple’s a mobile company. It’s mobile because of iPhone, mobile because of iPad. But the Mac is predominantly a mobile business as well. Just to update the latest with 80/20 [percent] notebooks to desktop [sales], if anyone’s interested in that. As we see the Mac business rebound, a lot of the strength of that is in the mobile products. In fact our brand new MacBook Pro is in Q1, was about 20 percent growth year over year from the previous year. So again, our notebooks are doing really, really well. So as we look at the Mac, at the pro customers, there’s so many definitions of them. One of the things we looked at was the mix of products they use from us, and the mix of applications they use and how do you kind of get a handle on who’s a pro, who isn’t. If you look at it from an application perspective, what we find is that about 15 percent of our Mac customers use what you’d categorize as a professional application on a weekly or even multiple-times-a-week basis. That’s a kind of customer you could look at and say there’s someone who’s job probably relies on the work they do – using pro apps multiple times a week. That’s a pretty large percent — 15 percent. And then if you look at a little broader view, customers who use pro applications less frequently than once a week, that’s almost 30 percent of our customer base. Across all of that, as we’ve said, we’re a more mobile than desktop company; of the people who use pro apps, and define themselves as pros, our largest product used by those customers are notebooks. Notebooks are by far and away our most popular systems used by pros. Second on the list is iMacs — used by pros, again by the people who use professional software day in, day out, not just casually. Third on the list is Mac Pro. Now, Mac Pro is actually a small percentage of our CPUs — just a single digit percent. However, we don’t look at it that way. The way we look at it is that there is an ecosystem here that is related. So there might be a single digit percentage of pros who use a Mac Pro; there’s that 15 percent base that use Pro software frequently, and 30 percent who use it casually, and that these are related. These are not distinct little silos. There’s a connection between all of this. John Gruber (Daring Fireball): I just want to make sure I understand the stat right. Is it single digit percentage of pros who use Mac Pros or of all Macs? Phil Schiller: Of all Macs… are Mac Pros. Presumably the predominant use of that is by pros; there may be some that aren’t. So we see the largest use of portables, then iMac, then Mac Pro. But we don’t think it’s a scenario where… this segment isn’t important to these other segments. These things are related. And the fact that pro software can touch 30 percent of the polled Mac customer base is significant and important in the fact that it’s related to the 15 percent that use it frequently, and the [single digit] percent that use Mac Pros, we do think there’s a connection here and an importance to all of that. Obviously, as you know, we just did a very major update to the MacBook Pro line. That’s going very well. Customers absolutely love it, we’ve had a lot of customers buying them. Big numbers, as I said, 20 percent growth year over year. We’re very proud of those products; we know there’s feedback on things that can be done better on them. There’s things that we want to do better on them. We know they matter to our pro customers, and we have every intention to advance that Mac Book Pro line in the years ahead and make it better and better for our core customers, but we think we’re off to a good start there. Next up: we have plans on iMac, to move that line ahead, and do great things on iMac. It’s core to our Mac business and our customers, including making configurations of iMac specifically with the pro customer in mind and acknowledging that our most popular desktop with pros is an iMac. We want to do things with the iMac in the future to help address those pro needs, and make it… not only continue, but more of a capable machine for pro customers. Craig Federighi: That is a pretty incredible evolution that we’ve seen over the last decade. The original iMac, you never would’ve thought as remotely touching pro uses. And now you look at today’s 5k iMac, top configs, it’s incredibly powerful, and a huge fraction of what would’ve traditionally required the Mac Pros of old and are being well addressed by iMac — whether its audio editing, video editing, graphics, arts and so forth. But there’s still even further we can take iMac as a high performance, pro system, and we think that form factor can address even more of the pro market. Phil Schiller: With regards to the Mac Pro, we are in the process of what we call ‘completely rethinking the Mac Pro.’ We’re working on it. We have a team working hard on it right now, and we want to architect it so that we can keep it fresh with regular improvements, and we’re committed to making it our highest-end, high throughput desktop system, designed for our demanding pro customers. In the interim, we know there are a number of customers who continue to buy our current Mac Pro. To be clear, our current Mac Pro has met the needs of some of our customers, and we know clearly not all of our customers. None of this is black and white, it’s a wide variety of customers. For some, it’s the kind of system they wanted; for others, it was not. Craig Federighi: I think it’s fair to say, part of why we’re talking today, is that the Mac Pro — the current vintage that we introduced — we wanted to do something bold and different. In retrospect, it didn’t well suit some of the people we were trying to reach. It’s good for some; it’s an amazingly quiet machine, it’s a beautiful machine. But it does not address the full range of customers we wanna reach with Mac Pro. Maybe John [Ternus] can talk briefly about some of the elements that led us there and what the implications are… but we have work to do to build a machine now that we know the full breadth of our pro market needs. John Ternus: I think one of the foundations of that system was the dual GPU architecture. And for certain workflows, certain classes of pro customers, that’s a great solution. But, to Phil’s point, ‘Pro’ is so broad that it doesn’t necessarily fit all the needs of all the pros. The way the system is architected, it just doesn’t lend itself to significant reconfiguration for somebody who might want a different combination of GPUs. That’s when we realized we had to take a step back and completely re-architect what we’re doing and build something that enables us to do these quick, regular updates and keep it current and keep it state of the art, and also allow a little more in terms of adaptability to the different needs of the different pro customers. Lance Ulanoff (Mashable): I’m just curious, at what point did you realize that? I remember the big launch, and seeing it, and I remember similar words: ‘This is something completely new and different, we’re really redoing this!’ and we were all thinking: ‘Wow, this is hot.’ We were all excited about the exterior in particular. But at what moment in the product cycle did you think: ‘Oh… This is maybe not the end all, be all.’ Did that happen six months ago? Where did you get the telemetry that told you that? Craig Federighi: I’d say longer than six months ago. But I think we designed ourselves into a bit of a thermal corner, if you will. We designed a system that we thought with the kind of GPUs that at the time we thought we needed, and that we thought we could well serve with a two GPU architecture… that that was the thermal limit we needed, or the thermal capacity we needed. But workloads didn’t materialize to fit that as broadly as we hoped. Being able to put larger single GPUs required a different system architecture and more thermal capacity than that system was designed to accommodate. So it became fairly difficult to adjust. At the same time, so many of our customers were moving to iMac that we saw a path to address many, many more of those that were finding themselves limited by Mac Pro through a next generation iMac. And really put a lot of our energy behind that. In retrospect, that was… While that system is going to be fantastic for a huge number of customers, we want to do more. We did not fully come to terms with our need to do more until later than we’d like, with the implication that the next-generation Mac Pro that many of our customers — well, some of our customers, it’s relatively small in the grand scheme of things, but a very important group of our customers want — until quite a while from now. Matthew Panzarino (TechCrunch): If Point A is when you’re thinking ‘Uh-oh, we need to do this’ or ‘no no, but we need to make a new Mac Pro’ and Point B is when it’s coming out. Why is there a gap? Is the CPU the gateway there? Or is it just design — you need more run-up to get it right? I know obviously this generation of CPU that’s hitting this year probably won’t provide you a significant enough bump…Is that a consideration, or part of the consideration? John Ternus: I think mostly it’s just getting the time to do the design right. Make sure we land with an architecture and a design that has legs. That we’re really sure is the right thing… We design something, it takes time for us to build the products we build, so it’s not so much about the CPU, it’s more about the overall system. Phil Schiller: Yeah, we’re not ready to talk about that yet. Further down the line, we’d be happy to. Before we go into more questions, a couple of other things I didn’t want to miss hitting on. About the software. Now and then we do get some questions about strategy and software for pros. I just want to reiterate our strong commitment there, as well. Both with Final Cut Pro 10 and Logic 10, there are teams on those software products that are completely dedicated to delivering great pro software to our customers. No foot off the gas there. They’ve been certainly listening a lot to customer feedback, doing a lot of updates. They’ve been very well received. We think we’re on good paths there, and the customers are by and large really happy with the direction and the support they’ve been getting and that’s going to continue. No plan on slowing that down one bit. A growing group for us is software developers. We’re obviously responsible for software tools and SDKs and much more there. And we’re continuing to invest in that, all the way from languages to compilers to tools, etc. Our dedication remains really strong on all of that. Phil Schiller: Lastly, I’ll just say that with the current generation Mac Pro, which some customers love, others… may not. One of the things that’s certainly clear and true about that was the team set out to do something different, something bold. And we always want to encourage the Mac team, that whatever products you make to make customers happy, that we do bold work. Because the Mac has always been about that, it’s been about not doing conventional thinking, not ‘me too’ stuff. So the team certainly has been spending a lot of time with customers to understand what better would fit most workflows, to take the time to do something great, and something inspired and that we’re proud to put the name Macintosh on. I think we hit most of the points we wanted to make. And I’m sure you have lots more burning questions. 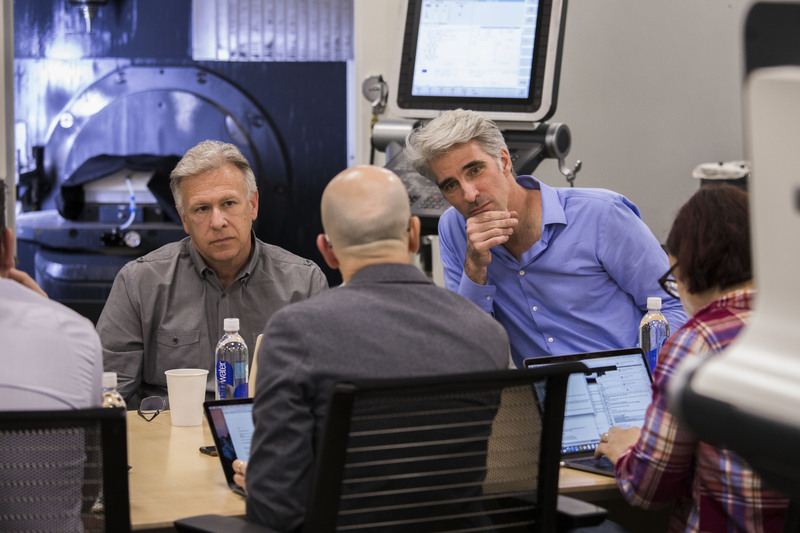 John Ternus during a roundtable conversation with journalists on the Mac inside the machine shop at Apple’s Product Realization Lab. John Gruber (Daring Fireball): Right out in the lobby was the original iMac G4, with the display on a hinge [that one]. Would you compare the Mac Pro and the need to completely rethink it to that? I remember when [the iMac G4] was introduced, the narrative was ‘The most obvious thing to do with a flat panel is to stick a computer on the back, we didn’t want to do that.’ And then it ends up that the real future of the iMac was: ‘Here’s a beautiful display with a computer on the back.’ Is it similar? You had a great idea, and a couple of us were saying that we loved that design! But obviously it wasn’t… Is it a similar sort of angle, an alley worth taking when you realize it’s a dead end? Phil Schiller: I wouldn’t want to make that exact analogy because it presupposes a lot of things that may not be correct. I think that the simple answer is, as we’ve said, we made something bold that we thought would be great for the majority of our Mac Pro users. And what we discovered was that it was great for some and not others. Enough so that we need to take another path. One of the good things, hopefully, with Apple through the years has been a willingness to say when something isn’t quite what we wanted it to be, didn’t live up to expectations, to not be afraid to admit it and look for the next answer. There are many examples of that, but there’s examples of that philosophy, but not so much the details. The details are quite different. Craig Federighi: I think initially, certainly from a market reception point of view, the current Mac Pro design was well received. It wasn’t that sales fell off at all. But the architecture, over time, proved to be less flexible to take us where we wanted to go to address that audience. In hindsight, we would’ve done that differently. Now we are. Lance Ulanoff (Mashable): The limitation that we’re talking about, you keep talking about architecture. How much of that is tied to actual design? I remember the triangle on the inside and the cone on the outside were very much tied together. How much of the limitations that you’re talking about are connected to that design? John Ternus: The triangle you mentioned, the thermal core, is designed to have three fairly similar loads – similarly balanced in power. And so the overall size of the product and the fan, that defines the overall thermal capacity for the enclosure. And we didn’t see as much take up in dual GPUs and we would have expected. And certainly there’s other applications where it’s not necessarily the right thing. So, for certain classes a single bigger GPU would actually make more sense. But that architecture doesn’t really support that. The way the product was constructed was with these three balanced loads in mind. So, again, it served its purpose well and created a really quiet and powerful machine using it for a certain class of things, it just didn’t necessarily have the flexibility that we need to have. John Ternus: I think some of the science and technology of those types of applications certainly. Craig Federighi: There’s certain scientific loads that are very GPU intensive and they want to throw the largest GPU at it that they can. There are heavy 3D graphics or graphics and compute that mix loads. Those can be in VR, those can be in certain kinds of high-end cinema production tasks where most of the software out there that’s been written to target those doesn’t know how to balance itself well across multiple GPUs but can scale across a single large GPU. Matthew Panzarino (TechCrunch): We had like 30 years of CPU-forward thinking and in the last few years, GPU computation has become much more central. John Ternus: And it’s certainly growing at a faster rate than CPUs as well. Lance Ulanoff (Mashable): Going back to what you were talking about with the iMac and the MacBook Pro – when you talk about a Mac Pro-specific display, with whatever you do as the box. Maybe they’re altogether. Would you consider a touch display? Phil Schiller: No [laughter]. We’ve talked a lot about touch on the Mac. It’s certainly, as we’ve talked to pros, not a big request for things they would want in a Mac Pro and not the problems that they most want us to solve. And then, of course, there’s the whole other discussion we’ve had many times about why we believe that MacOS and iOS are distinct and each optimized to be best at what they’re best at. That’s a whole other long discussion we can get into, but suffice it to say, it’s not a big need of the Mac Pro customers that we’re trying to address. You mentioned again and how we’re talking about both the iMac and MacBook – I do think that we have a two-prong desktop strategy. We think both iMac and Mac Pro are going to be important for pro desktops. Ina Fried (Axios): You mentioned touch. When Microsoft showed off the Surface Studio, a lot of people were like ‘wow, Microsoft’s out there looking at the next generation of creative pros.’ Is there a segment of creative pros that you think do want something that can tilt down and they can use a stylus with? You guys have always said you’re going to focus on a few things. But do you think this segment of creative people exists? Or is it just not of interest in general? Phil Schiller: There’s two parts. First, we’ve been talking to Mac Pro users – and the rest of the pro users: iMac users, MacBook Pro users. This does not even register on the list of things they’re most interested in that we talked about: GPUs, storage, portability and many different things, all of which that has nothing to do with. So that’s not very important. Craig Federighi: I would say that talking to some of those same people in video production, illustration and so forth, they are very excited with the iPad in that context. The iPad Pro, the Pencil, seem to have really hit the mark with that audience. And they are not saying: ‘why can’t I do that on my Mac Pro?’ They’re really excited to take advantage of it on the iPad. So that’s absolutely an area where we want to continue to make the iPad more and more capable. Phil Schiller: Exactly. So that kind of a product you’re referencing isn’t a great pro desktop. For the things they’re asking us for, it is not — in terms of performance, expandability and all of those things. And as a drawing surface, we think it’s a compromised product as well compared to what we’ve done with iPad Pro and the performance it delivers and the portability it delivers and the ability to directly interact with it. It’s a better form factor. And that’s an example of the bigger topic. We still think that Mac makes for the best personal computer operating system because it is designed around that, first and foremost — with its Cocoa interface, its indirect manipulation with a mouse, its trackpad and the things you do let us design a system best used for those kinds of applications. And iOS, with its Cocoa touch-based experience is built all around that and is based on the system best optimized for that. So we can make the best of each, rather than a lowest common denominator that would compromise each. Craig Federighi: We all certainly use both, so we’re really focused on making them work well together, because we think in many tasks, that’s actually the best solution. So all of our customers should feel free to buy multiple products [laughter]. We encourage that. Ina Fried (Axios): We’ve seen over time you leading the industry and getting more and more performance out of ARM. Everyone looks at the curves going up. As you guys look at different trends that are taking over, do you see ARM-based chips playing a role in desktops and Macs in the future? Craig Federighi: We’ve actually see that a little bit already. [With the] T1, I think we called it? But it brings some of the authentication, the Secure Enclave processor, for instance, out of our iPhone SoCs and makes them available on the Mac. So we see a really interesting complementary role for our silicon working with Intel. And we certainly work with Intel on our needs to deliver chips into our Mac roadmap and we see that continuing. John Ternus: But it’s obviously a huge opportunity for us to have what I think is probably the best silicon design team in the world, so we can bring those Apple-specific features into the Mac. Matthew Panzarino (TechCrunch): The Touch Bar’s been out and people have been poking at it, and I’m sure you guys have been anonymously recording pokes. Based on your learnings, are you seeing that as having a place in the iMac or the Mac Pro? The paradigm of a combination of an interactive changeable display and physical keys. Phil Schiller: We think we’re off to a good start with the Touch Bar. That it is intuitive for everybody in general and specifically does give some incredible capabilities for pro users. And as we’ve started to see more and more adoption in pro apps, our own – obviously Logic supports it, as does Final Cut and third-party apps have done a real good job starting to support it. We’re seeing some really brilliant uses of it. And we think that this is a good path that we’re on. The opportunity to integrate touch where it can most add additional value in the Mac experience is the smart way to go, just as we’ve made the trackpad better at gestures and a really smooth, intuitive experience. We think that’s a great place to go with touch and that’s what the Touch Bar is. We’re still going to learn a lot more. It hasn’t been that long that it’s been out there and we’re still trying to learn and gather data from customers – research mostly and a lot of different interview with customers and we’re going to learn. And we think, if we’re right, this is a great direction for the Mac. John Gruber (Daring Fireball): How do you square the fact that the pros’ needs vary greatly with the fact that you guys don’t offer a wide range of hardware. If you want the latest range of MacBook Pros, you’re getting one that’s a lot thinner and lighter, even though some pros really need the most battery life that they can possibly get. Phil Schiller: Well, you know that we’ve always tried to strike that balance between meeting as large a group of users’ needs as possible, while making the fewest number of products that enable that. So we can put energy into making them really great. Great performance, great quality, great innovative features. If you dilute too far, those become counterproductive with each other. So we work hard at trying to do both. And sometimes we nail it and sometimes we go back to the drawing board and try harder. So that’s what we have to do. We have to try to make the product line that meets most users’ needs, as varied as those needs may be. I think, as you talk about the pro user, the fact that our user base is split over notebooks, all-in-one desktops and modular desktops is important. We aren’t making one machine for pros. We’re making three different designs for pros. We’re going to continue to. Phil Schiller: I wish I could give you the kind of answer you want with that, which is, ‘oh, there was a day and a meeting and we all got together and said X,’ but it rarely works that way. Craig Federighi: We all went on our own emotional journeys, I’d say [laughter]. There were periods of denial and acceptance. We all went on that arc. John Ternus: There definitely wasn’t a single point. Looking at how things are doing, looking at what we can do within the space and eventually come to a conclusion, but it’s not like it’s an a-ha moment. Ina Fried (Axios): To follow up on that, I assume some of those collective realizations came when you guys wanted to update it and you looked around and said: ‘If we’re going to do an update, this is what people want. You can’t do that. I’m not sure shoving 30MHz faster dual-GPU helps that much, so we’ll just leave it.’ I assume just from the outside, looking at the product cycle, there had to be those sorts of meetings. Craig Federighi: There definitely were. That’s absolutely right. Lance Ulanoff (Mashable): Is there a difference in the way these pro products are designed and developed as compared to an Apple Watch, where form follows function or function follows form? Which is driving? It sounds like on the pro side you’ve got a lot more of the function. You’ve got the pro needs come first and then you wrap something around it. I don’t know if that was the case when the Mac Pro was designed. But is there a difference? John Ternus: The process for how we design things is largely the same. We go through the process with all of our products. Certainly, how you make the tradeoffs and the priorities you have in a certain product are going to be different based on the products you’re trying to address. So a 15-inch MacBook Pro, we’re pushing really hard to get the most performance we can do in the form factor that’s the way we want it. We want it to be light, we want it to be portable, we want it to be beautiful. Obviously you make a different set of tradeoffs when you’re building a 12-inch MacBook. The product serves a different need. So the goals are different. But we didn’t start with a shape and say ‘here’s the fastest machine we can put in that box.’ We actually started with a target for performance and came up with what I think was a very clever design of that thermal core and thermal architecture to accommodate what we thought was the right power architecture. What I think we didn’t appreciate completely at the time was how we had so tailor-designed that specific vision at the time that in the future we would find ourselves a bit boxed in to a circular shape. We were boxed by a circle [laughter]. Ina Fried (Axios): One other takeaway is that pros value a couple of things – well, they value a lot of things. The two times I can remember Apple designing a really cool product that didn’t necessarily meet a broad audience are this and the cube [PowerMac G4 Cube]. And the lesson was that they value that expandability, more options. Is it a lesson now that you guys are beginning to think about the next thing, that it needs to be more traditionally shaped and traditionally open? Craig Federighi: I wouldn’t say we’re trying to paint any picture right now about a shape. It could be an octagon this time [laughter]. But certainly flexibility and our flexibility to keep it current and upgraded. We need an architecture that can deliver across a wide dynamic range of performance and that we can efficiently keep it up to date with the best technologies over years. I think it’s a strength of the company that we see new technologies creating new opportunities. We tend to try to jump on those pretty aggressively and so you look at that architecture of that Mac Pro, it had great Thunderbolt external I/O and we said: ‘This is a great opportunity to change what had been a conventional build a big card rack and slot a bunch of cards in there.’ We said: ‘a lot of this storage can be achieved with very high performance with Thunderbolt. So we built a design in part around that assumption, as well. Some of the pro community has been sort of moving that direction, but we had certainly in mind the need for expandability. If you wanted a great RAID solution in there, it probably made a lot more sense to put it outside the box than actually be constrained within the physical enclosure that contained the CPU. So, I think we went into it with some interesting ideas, and not all of them paid off. 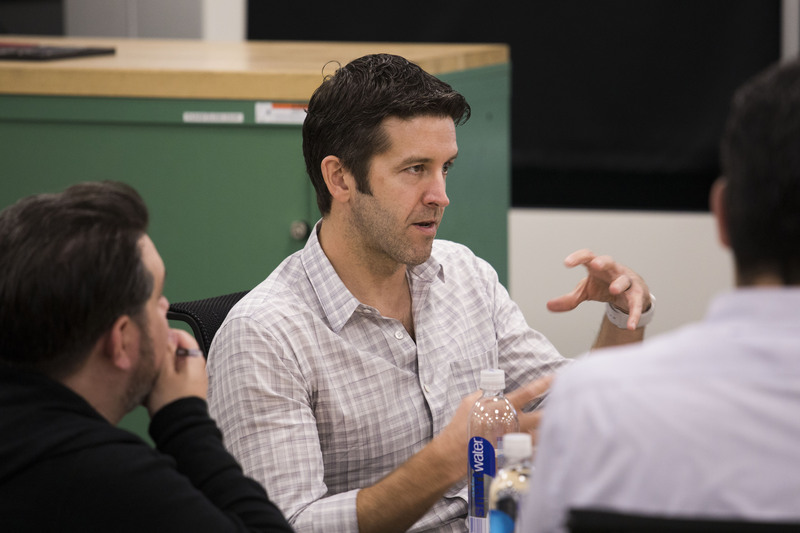 Matthew Panzarino (TechCrunch): What’s your philosophy on external GPUs? Craig Federighi: I think they have a place. Matthew Panzarino (TechCrunch): Seems like it would have offered the maximum flexibility in the space where you would never have to worry about thermal problems theoretically as long as the external GPU was built right. John Ternus: I think there’s some aspects of them where they’re going to be beneficial and there’s some workloads where they’re going to be less effective. Phil Schiller: The Mac has an important long future at Apple. Apple cares deeply about the Mac. We have every intention to keep going and investing in the Mac. It’s important to us, it’s important to our customers — including Mac Pro users, all pro users, including Mac Pro. And if we’ve had a pause in upgrades and updates on that, we’re sorry for that, what happened with the Mac Pro, and we’re going to come out with something great to replace it. And that’s our intention. We care about our Pro users who use MacBook Pros, who use iMacs and who use Mac Pros, who use modular systems as well as all-in-one systems, who use the pro software we make. It’s all important to us and we’re invested in that and we see a long future with that stuff. Craig Federighi: We certainly see, as I know you do, a wide spectrum of views expressed in internet forums about all things, including our products. I think it’s not entirely unreasonable and it’s understandable that some people who love their Macs so much and see something new that Apple is talking about in the form of iPad, creating in some of them a sense of insecurity: ‘What does this mean? There’s thing I really care about, I don’t want to see it go away, I see this other new thing on the scene, what does this mean to me, what does this mean to the product I love?’ So I understand how that would come out in the form of concern that this is happening, but this is not happening. The Mac is — we say it over and over, we’re saying it again here — a huge part of our future, we’re deeply invested in it. John Ternus: Some of our most talented folks working on it. I mean, quite frankly, a lot of this company, if not most of this company, runs on Macs. John Ternus: This is a company full of pro Mac users. Phil Schiller: It’s a reasonable question, and this is why we’re here today, specifically, to address that question above all else. We’re committed to the Mac, we’ve got great talent on the Mac, both hardware and software, we’ve got great products planned for the future and as far as our horizon line can see, the Mac is a core component of the things Apple delivers, including to our Pro customers. Phil Schiller: We’re not going to make any promise, or anything that should be misinterpreted as ‘Here’s what Apple said they’re going to do in the future on the Mac Pro.’ I will point out that we make decisions at a product-by-product level — thinking about the ecosystem of how things work together but also at a product level. Just because on one product we remove something doesn’t mean we’re going to remove it from everything if it doesn’t make sense. So there’s no reason to draw any conclusion. For example, [saying] what we choose to do on a MacBook Pro means that that’s all we will do on a desktop in the future. That’s not a reasonable conclusion. We make choices based on a variety of factors per product. Ina Fried (Axios): You talked a lot about the feedback you got on the Mac Pro. There’s certainly been feedback — people like a lot of things about the new MacBooks, don’t love the battery life. What would you say has been the pro feedback? What have you learned from what pros are saying about the new MacBook Pros? Phil Schiller: First we’re still gathering a lot of feedback. I wouldn’t say we’re done synthesizing all that we’re learning. In general, it’s been incredibly well received, it is a popular product — in fact, I think it’s one of the most popular pro notebooks we’ve made in our history. In total, the story’s really good. It doesn’t mean there isn’t feedback there of things we can make better, of course there is. But in total, the feedback’s really good. As we’ve said, there’s a lot of different kinds of pro users, so we can’t over simplify. But in general, I think we’ve hit a real sweet spot with the product. I think battery life was an early area where there was some feedback — that’s actually died down greatly. Not to say again that we can’t get better, but many people are getting great battery life out of it. It certainly is very competitive with anything in the industry, stands up really well, the balance of performance and battery life it gets. In fact, I read a really neat test over the weekend where we were the only notebook tested that met or exceeded its battery life claims. Everything else was pretty poor. Phil Schiller: And so it was great to read that, but we can continue to make things better. But that’s been well-received. Generally there’s certainly been feedback about I/O. I think the I/O has been for some great because of the performance it delivers and the flexibility it delivers. Others would like some legacy connectors, but there are adapters for that. We’re not done gathering feedback, but generally things are going really well with it. Craig Federighi: And we did have some software issues particularly affecting the 15-inch. It could result on switching to the discrete GPU under circumstances where we shouldn’t have, and then consuming power on the discrete GPU on levels that were in excess of what was appropriate, which was responsible for some of the issues there. Since the fixes we put out in December, I want to say, the fleet battery (the metrics for those who opted in to sending Apple diagnostics). The average increased by an hour on those systems in battery life. And those systems, despite the initial reaction externally, those systems have considerably better battery life than the systems they replaced. And so it was a little bit of a shock to us, honestly. We were so excited to put those machines out and deliver great battery life to our 15-inch customers, and then got that reaction from a subset of the users that were unhappy. Those systems have better battery life than any 15-inch machine we’ve ever shipped. And I’m glad we got the software fixes out there to let that machine shine to its full capability. John Paczkowski (BuzzFeed): What about the Mac Mini? It hasn’t come up once yet. Is there a reason? Phil Schiller: On that I’ll say the Mac Mini is an important product in our lineup and we weren’t bringing it up because it’s more of a mix of consumer with some pro use. So we’re focusing today specifically on the things that are important to pros. While there are some pro usage, there’s also a lot of consumer uses so we aren’t covering it today. The Mac Mini remains a product in our lineup, but nothing more to say about it today. If we haven’t communicated that, we have a lot of people working on the Mac — a lot of really brilliant people invested in great new products in both infrastructure and people — then we haven’t done our job here today because we do have a lot of resources on the Mac, and that’s gonna stay. Ina Fried (Axios): I don’t expect you to give us numbers, but is the team growing? Is it the same as a while ago? Craig Federighi: On the software side, it’s difficult to account for, because our overall org has grown substantially over the last couple years. More and more, when you talk about work on the kernel or the security sub-systems, or the graphic architecture, or the compiler, or the rest of the developer tools. Even some of the sort of mid-tier object-oriented frameworks. It’s all the same teams. People externally have misconstrued: ‘Look what’s happening to the Mac team! They’re all together!’ I mean, they are — for good reasons. For our developers, we think we want a common platform at the lower level for a developer to build an app that could work on iOS, even tvOS, MacOS. The differentiated bits are the higher level user environment and some of the highest level frameworks that target that user experience. The number of people focused on the common technologies, as well as the distinct technologies to each of those platforms, has definitely grown over the last several years.